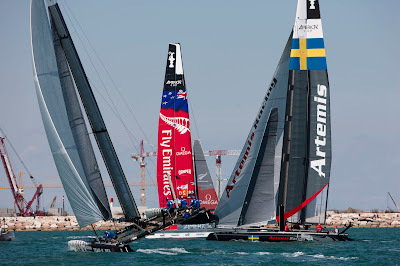 Youth and experience won on the opening day at the America’s Cup World Series in Venice, Italy. Team Korea’s Nathan Outteridge, at 26 years old one of the youngest skippers in the fleet, won the first fleet race. Then, Loick Peyron, 52, rallied his team for a come-from-behind win in race two to top the day’s leaderboard. As Peyron indicated, it was beautiful racing weather in Venice on Thursday. The sea breeze was in the 8 to 11 knot range, under crystal clear, sunny skies. Not surprisingly given the conditions, the local spectator fleet was out in force to enjoy the competition. Overall AC World Series leader Jimmy Spithill and his ORACLE TEAM USA crew had a difficult day in the fleet racing Thursday, posting an 8-4 scoreline to sit in seventh place on the leaderboard. 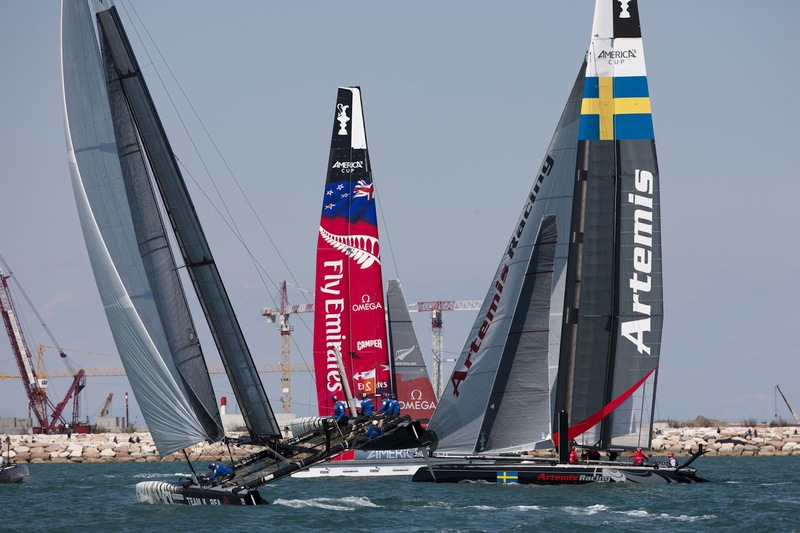 Dean Barker’s Emirates Team New Zealand, second in the overall Series, wasn’t able to take full advantage, underperforming their own high expectations in fourth place, just three points clear of Spithill. The local favorites, Luna Rossa, had mixed fortunes on the day. The Piranha team, led by Chris Draper, battled to a sixth place finish on the day. But Paul Campbell-James’ Swordfish crew, with skipper Max Sirena, had two finishes in the top four, and holds down second place. To earn his third place position in the Fleet Racing, Team Korea’s Nathan Outteridge sailed a flawless first race to record his first race win in the AC World Series (Outteridge joined the team in Naples). But in the second race he had to fight from behind after a poor start, eventually clawing up to sixth place in race two. In the opening races of the Match Racing Championship, China Team was eliminated in a one race qualifying match by ORACLE TEAM USA - Bundock. 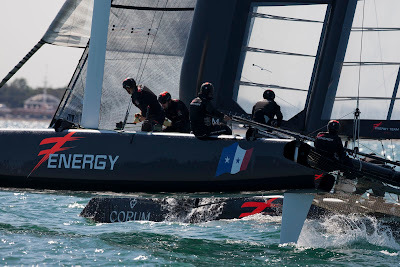 Then, all of the Quarter Final pairings were 2-0 sweeps with Energy Team, Artemis Racing, ORACLE TEAM USA Spithill, and Luna Rossa Piranha advancing to the Semi Finals. The losing teams have been assigned their final finishing positions (below) as per the Sailing Instructions. Earlier in the morning, the Red Bull Youth America’s Cup was launched at a ceremony just off the iconic St. Mark’s Square in Venice. The new event provides a distinct pathway for young sailors, 19-23 years old, to get the experience they need to become America’s Cup sailors. Racing in the Red Bull Youth America’s Cup will take place in San Francisco in the summer of 2013.